In November, as you may recall, Xerox was announced as the university’s new supplier for multi-function devices (MFD). Xerox is currently contacting pilot departments and will soon be communicating with additional departments that have a significant number of expired Konica Minolta leases. Xerox will be scheduling appointments with those departments to review the current state of their copier equipment and will then make recommendations for replacement with Xerox MFDs. Delivery of Xerox MFDs will begin in late February or early March. Please refer to the Procurement Services Xerox contract page for additional information. More information about Xerox Sustainability and Xerox Citizenship. 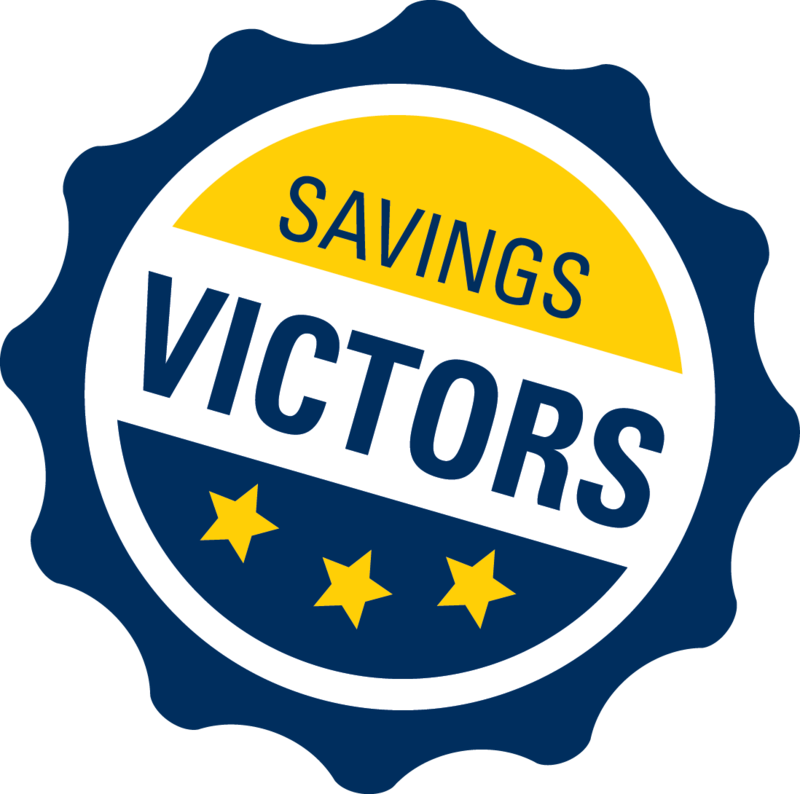 Karen Bakkenbowers, a finance manager at the Ross School of Business, is the most recent recipient of the Savings Victors award. In her role, Karen works diligently to ensure faculty and staff in Executive Education follow the policies and procedures for procuring goods and services. Beyond that, Karen strongly utilizes the university’s strategic contracts for savings and reaches out to Procurement Services to see if there are existing contracts in place that might meet the school’s needs or, if no contract is available, she seeks advice on how to best proceed. “Karen also stresses the importance of contacting us at the beginning stages of the purchasing process rather than at the end,” said Kevin. Once a year, Karen invites Procurement Services to meet with the Ross Executive Education team for an update on current contracting and procurement policies and procedures including signature authority. Concur recently introduced enhancements and improvements to its mobile application. Recording and updating per diem is part of the new functionality offered. In addition, updating allocations is now available (initially for iPhone only). Enhancements include an updated home screen for Android users and improvements to the way receipts are captured and displayed. For complete details, see February 2017 release. The university pays Concur based on the number of expense reports submitted. As recommended in our Best Practices, please limit your report submissions to 1-2 per month when possible. Delta has introduced a “Name Change” program that will provide travelers with more flexibility in applying the value of unused tickets towards a new booking, allowing you to better utilize your travel budget. 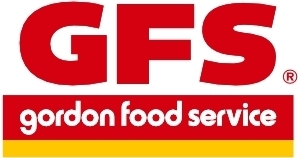 After a thorough and extensive request-for-proposal process, Gordon Food Service (GFS) has been selected as our future strategic partner for food and food-related products. Student Life and Michigan Medicine’s Patient Food and Nutrition representatives assisted procurement in developing requirements and evaluating supplier proposals, presentations, and site visits. GFS will assume responsibility for providing the university with food products--a category with a $10 million-plus spend--on July 1, 2017. Until then, Sysco-Detroit, the university's long-time partner, will continue to provide service to U-M.
GFS is a Michigan-based company headquartered in Wyoming, MI. It is committed to sustainability and in sourcing local products that will count toward the university’s goal of purchasing 20 percent of its food from sustainable or local sources by 2025. 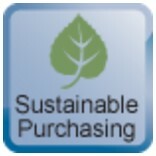 More information on GFS will be available on the Procurement Services website on July 1. Meet Colin Anderson, procurement manager in Procurement Services. Colin has been an employee at the university for over 20 years, primarily as a leader in Procurement. 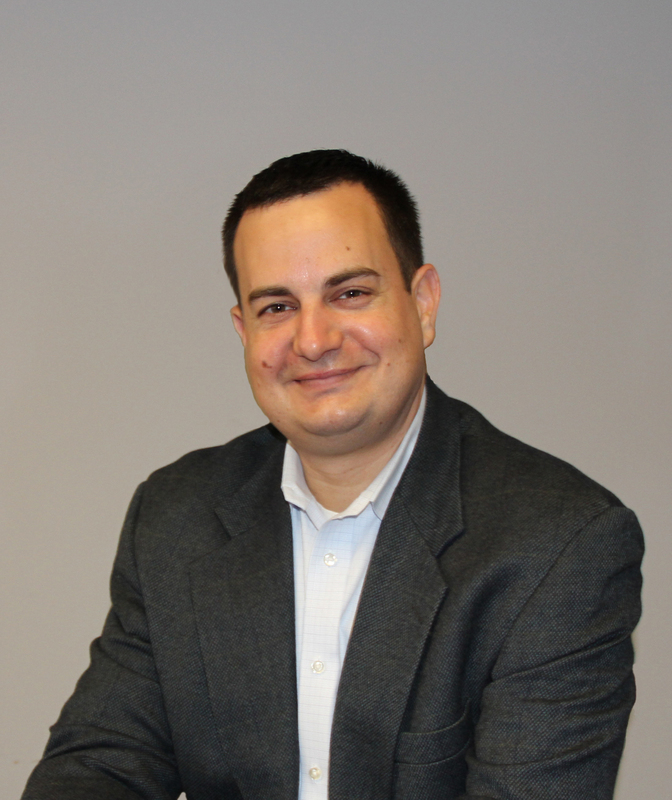 Colin oversees three procurement teams: Research, Print and Professional Services, and General Goods and Services. His teams are responsible for the university-wide procurement of goods and services and strategic contracts. As a member of the Procurement Services Lead Team, Colin plays a key role in the department's ongoing efforts to secure savings for the university community, reduce risk, provide exemplary customer service, and make the buying experience as easy as possible. Prior to joining the university and getting into procurement, Colin was in sales. "One of the most interesting parts about being in procurement is being in a position to see a global view of what the university is doing. I get to hear about everything from the latest research, to the construction of new physical infrastructure, to where the next study abroad programs will take place. I think it is a view of the size and scope of this university that few get to see." Outside of work, Colin enjoys spending time with his wife and three kids as well as photography, hiking, and playing guitar. He can also be found riding his motorcycle, on his boat, or brewing craft beers. Colin can be reached at colina@umich.edu or (734) 936-3881. Learn more about how Strategic Suppliers can help your department save time and resources! The project team also designed the survey to measure some of the challenges faced by procurement customers when buying sustainable products as well as their perception of sustainable products. The team is currently using the results of the survey to develop a marketing plan, expand supplier relationships, and identify website and M-marketsite improvements. The goal is to advance our sustainable purchasing program within Procurement Services and to support the university’s mission towards sustainable goals to be achieved by 2025. In addition, the team is currently meeting with suppliers to learn more about their sustainability efforts. Survey respondents were eligible to win one of four $25 Meijer gift cards. 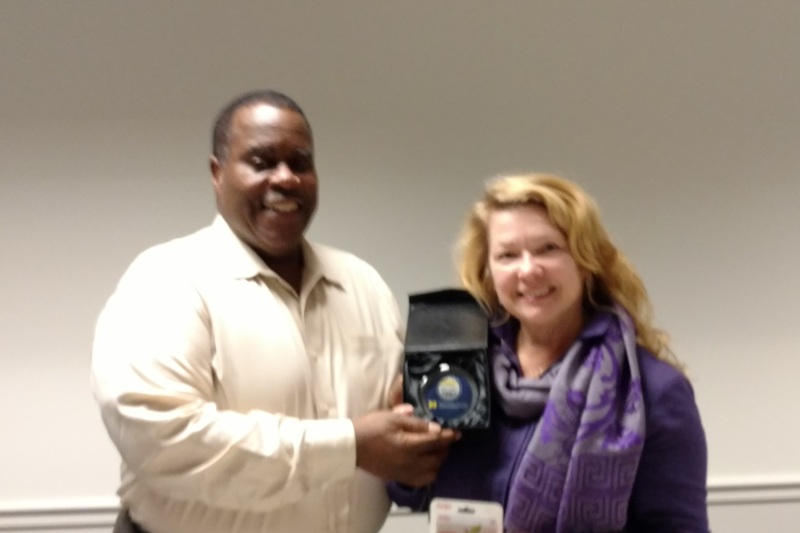 Members from the Sustainable Procurement Project Team presented the winners with their gift cards last month. 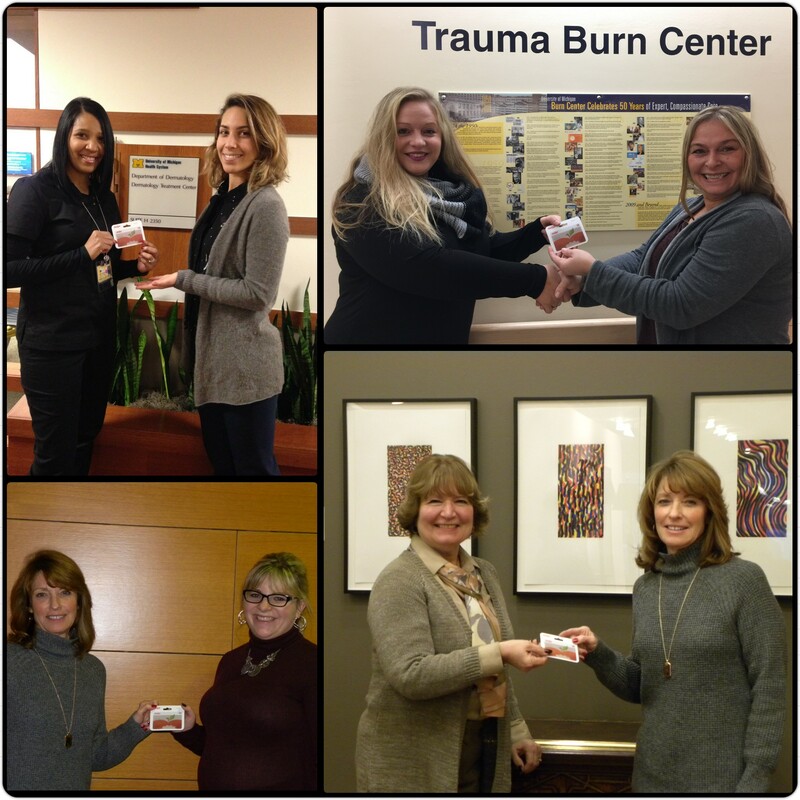 Winners were (clockwise from top left): Kristele Dyer, UMHS Photochem/Psoriasis Svcs, Kristina M. Brown, UMH Trauma Burn Center, Linda C. Peterson, CoE Undergraduate Education, and Allison Hartwick, Ross School Executive Education. A new functionality is now available in the HP punchout catalog. Customers can now process quotes for non-standard HP products directly in the HP punchout, instead of emailing them to the Technology Procurement Team for processing and cart assignment. View complete instructions with screenshots. Users of the Strategic Offset Print Program will be saying goodbye to the current SOPP system and hello to a new and more robust system called Quote to Order (QTO). Procurement Services has scheduled the rollout to the university in the spring of 2017. QTO will replace the Strategic Offset Print Program (SOPP) currently being used to manage print projects. “We wanted to enhance the SOPP system by designing increased functionality and navigation, while allowing for inclusion of a broader category of commodities, such as website and graphic design, temporary services, and audio visual services. Considering user survey feedback, it was determined that creating a new system, QTO, was the ideal solution” said Robin Eckel, strategic contract administrator. The plan is to begin adding other commodities to the program by late summer. QTO aids customers in estimating, purchasing, recording, and evaluating their commodity-based projects while aligning with the university’s branding guidelines. Stay tuned for future communications regarding QTO. The FY 2017 Annual Space Survey began on February 1, 2017. The survey includes the Ann Arbor, Dearborn, and Flint campuses, as well as summer camps and Michigan Medicine (formerly known as the University of Michigan Health System). Nearly 1,000 U-M departments report changes and updates occurring in their space including: use, activities capacity, and ongoing or completed renovations in 1,159 buildings, approximately 26 million assigned square feet, and nearly 114,000 rooms. Data collected from this annual survey is used in U-M’s Facilities and Administrative Cost proposal to establish indirect cost rates for research, instruction, and other sponsored activities. The space data is also used in U-M space utilization planning, Facilities & Operations, as well as state and federal reporting. For more information and instructions on how to complete the survey, visit the Survey Data page or email space@umich.edu. Please contact us with any feedback, comments, questions, or concerns at (734) 764-8212 or procurement.services@umich.edu. It’s easy to subscribe to Procurement Services News! Just login to MCommunity and locate the group “Procurement Services News.” After that, just click the “Join Group” button, and you’ll be on the list!